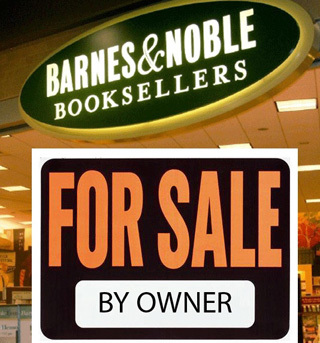 Barnes & Noble is considering putting itself up for sale to “maximize shareholder value.” Could that be part of a plan to ditch those brick-and-mortar stores and focus on Internet retail? The world’s largest book retailer, Barnes & Noble, announced Tuesday that its board of directors is considering selling the company in order to increase shareholder value. As the bookseller explained today, the board has formed a team to evaluate “strategic alternatives” to make sure it’s “taking advantage of [its] compelling digital opportunities.” Putting the company on the block is one of those alternatives. Just how compelling are these digital opportunities? B&N’s online store is exploding, with sales increasing 51% last quarter and 32% the quarter before that. In the next fiscal year, Web sales are expected to increase 75% to $1 billion. The Nook, Barnes & Noble’s answer to Amazon‘s Kindle, has arrived with a splash in the e-reader market, outselling the Kindle in its first month on sale. And a price drop in June should help swell the Nook’s success. B&N has been making further strides into the digital realm. In recent weeks, the company has been touting its apps for the Android. Just yesterday, the retailer announced a new Web-based textbook rental service for college students. The company’s recent forays into the digital market, coupled with today’s statement, suggests that B&N may be prepared to give up its brick & mortar operations. Of course, such a dramatic shift for the company is still a long way off, but even hints of a new digital direction for B&N ought to be a threat to Jeff Bezos. Take it from Blockbuster head Jim Keyes, who knows better than most. “Anyone with that much market share is vulnerable to new competitors,” Keyes said recently.